Some installations require a modern, minimalist style where functionality is the main requirement. The Diamond range of cubicles provides a strong aluminium framed cubicle system with minimal impact on the eye. The system can be colour matched to the panels, or coated in a contrasting finish to make a bold statement. Oliveti Diamond integrated Cubicles, Lockers and Seating Systems combine exceptional strength and durability with pure elegance and an extensive selection of colours and designs. Slim extrusions completely frame the partition and support the hinges and strike plates, ensuring the panels remain unstressed and last longer. The bolt through design allows quick and simple installation without the need for any special tools or experience. All fixings are included in the packs and full installation guides are available. Suitable for disabled door configurations. To meet ever increasing demands and challenges placed upon the market place, the system can be adapted to give additional privacy or increased security. Capable of transforming into a floor to ceiling or floating cubicle arrangement, the Diamond Cubicle offers a one stop solution to architects and specifiers. Designed to compliment the most prestigious of executive washrooms or wet room environments, the Diamond Cubicle can give a traditional, contemporary or ultramodern look, that can be colour co-ordinated to suit all tastes. Fittings are of a bolt through nature, with full partition height wall channels supplied for increased strength and durability. Finished in a range of colour co-ordinated polyester powder coatings that are applied in accordance with ISO900I accreditation, guaranteeing a superior product life span. Diamond Cubicles have been designed as a user friendly system that does not discriminate against members of society who have restricted movement or impaired vision. Diamond actively promotes access for all and aspires to ensure that a visit to the washroom is not a challenging experience for some, but rather an enjoyable one for all. 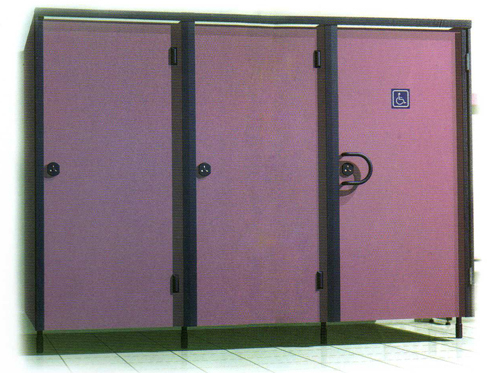 Wheelchair Accessible Cubicles can be easily incorporated into the system to ensure that provisions for all are met via the introduction of a sophisticated outward opening fascia section. The Diamond inward and outward opening doors blend together to maintain a stunning uniformity and aesthetic appearance to a room. The system is compatible with DOC M installations and is compliant with DDA regulations 2004. The futuristic indicator bolt surpasses current legislation, being suitable for use with the visually impaired. Approximately 96% of people registered blind or partially sighted have some degree of vision. In order to make the most of this residual vision, contrasts in colour and more importantly luminance can be employed to help identify objects and avoid hazards. Complying fully with the requirements Documents M Part 3.10 d & e,the lock can easily be operated with a closed fist, and is therefore suitable for use in all W.C. and changing cubicles including wheelchair accessible cubicles. Supplied pre-drilled, this ingenious system simplifies on-site installation reducing attendance time by up to 30%. A full set of details complete with system specifications and installation instructions can be found in our technical support manual. Fully qualified engineers are on hand to discuss any individual needs you may require.